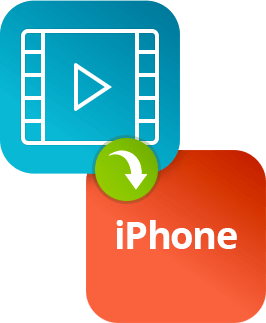 Want a video converter for iPhone? Looking for a way to convert video for viewing on your iPhone? Movavi Video Converter is a terrific iPhone video converter that lets you convert DVD, AVI, MP4, WMV, and other popular video formats for iPhone! No need to research video formats, settings, etc. 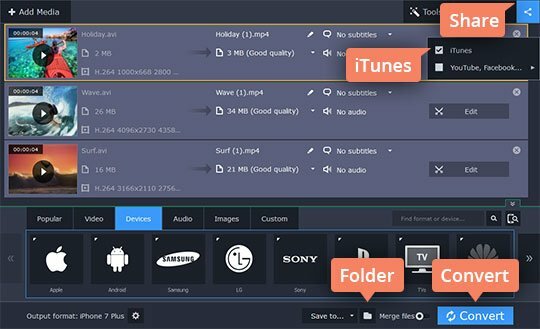 – just download the Converter, run it, add videos, select an appropriate preset, and click the Convert button to enjoy any video on your iPhone in no time! You can even extract soundtracks from your favorite movies and clips as well as convert music to the iPhone-compatible MP3 format. Just choose the appropriate version of the program and follow the steps below to quickly and easily convert video for your iPhone. Run the program. Click the Add Media button and then Add Video to select the videos you want to convert. 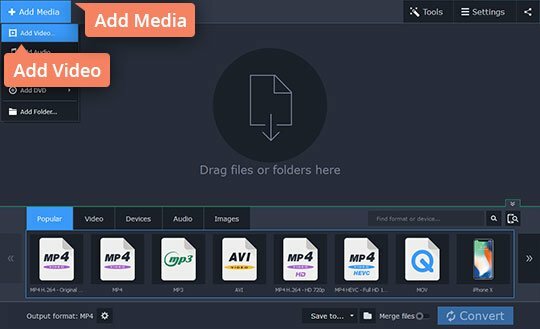 The Movavi software supports most popular video formats, so you can easily convert AVI, MP4, and almost any other video file to the iPhone format. 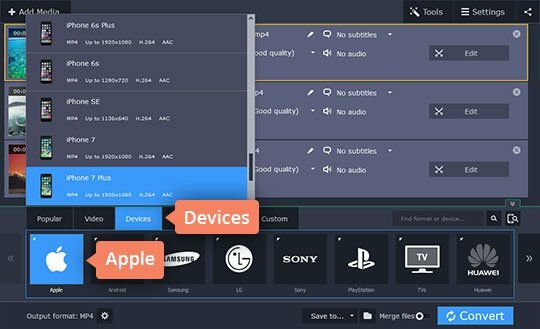 In the lower part of the Video Converter window, go to Devices, click Apple, and select the preset for your device model. Click the Folder icon to specify the folder in which to place the files converted for your iPhone. To transfer the files to iTunes automatically, click the Share button and check the iTunes box. Finally, click the Convert button – it takes just one click to convert your files to the iPhone format! Minimize or close the video converter's window. Then attach your iPhone to the computer and sync it with iTunes. To play the transferred movie on your iPhone, click iPhone Main Menu > Videos and then choose Movies. 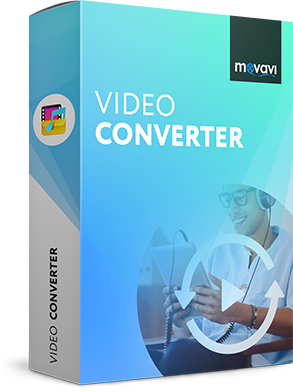 And that's all about converting videos to the iPhone format using Movavi Video Converter. Now you know how it is easy to watch all your favorite videos on your iPhone. IMPORTANT: To export movies from Movavi Video Converter to your iPhone, you must have iTunes 6.0 or later installed on your computer.